There are over 300 million tweets sent from around the world every day. And millions more are search queries. Twitter is a source for news and conversations, so what is everyone talking about this week? People around the world tweeted words of solidarity as the death toll from a powerful earthquake that shook the Philippines rose to 144 on Wednesday, with nearly 300 people injured. The quake caused widespread damage and smashed one of the country’s oldest churches. Centered about 32 miles underground near the small town of Carmen on the island of Bohol, the earthquake had a magnitude of 7.2. To put it in perspective, “a magnitude 7 earthquake has an energy equivalent to around 32 Hiroshima atomic bombs” said Renato Solidum, the director of the Philippine Institute of Volcanology and Seismology. Many stories and photos of hope were also shared across social networks, including a mother giving birth during the quake and people being pulled from the rubble alive. Conversation about tragedy was prevalent on Twitter this week, as users tweeted updates, prayers and hope to each other as a powerful typhoon struck eastern Japan on Wednesday. This “once in a decade” storm caused landslides and floods that left at least 17 people deceased and 43 others missing. The usually busy city of Tokyo ground to a halt as bullet trains and flights were suspended when the storm, Typhoon Wipha, swept through with strong winds and rain. Now, Typhoon Francisco poses a major threat for Japan as in nears. Officials expect Typhoon Francisco to hit land at some point next week, bringing along winds of 140-knots and higher. To see real-time updates on this typhoon, make a point to search for this in your Twitter feed- there are new alerts coming in constantly. Twitter, you make it so easy to see what people around the globe are feeling, and you made it very easy to see that not everyone was pleased when the Norwegian Nobel Committee awarded its prestigious 2013 Peace Prize to an international chemical weapons watchdog group. The online community expressed extreme disappointment over the Committee’s decision to pass over crowd-favorite Malala Yousafzai, the 16-year-old girl who is now determined to spread education for young females after the Taliban shot her while she was on her way to school. Malala certainly was a worthy candidate for the prize, which will be presented on December 10, but so is the little-known Organization for the Prohibition of Chemical Weapons, created in 1997 to help ensure that those countries that sign a U.N. ban on chemical weapons destroy their toxic stockpiles. 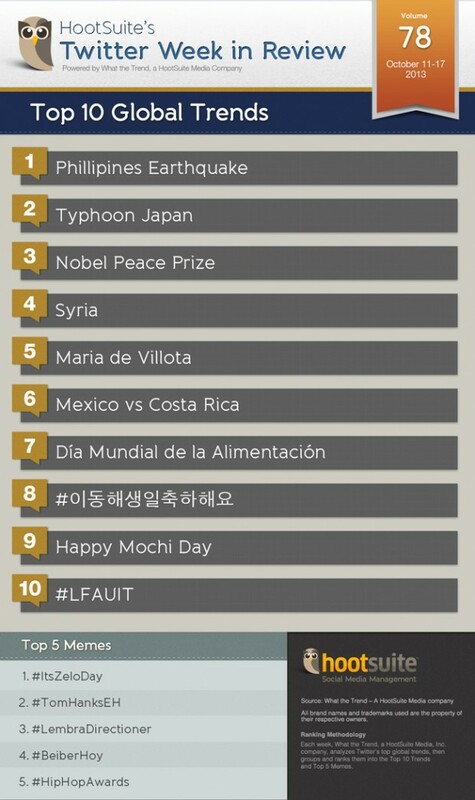 Syria yet again trended on Twitter this week, and it was because of something called the “Dear World” campaign. 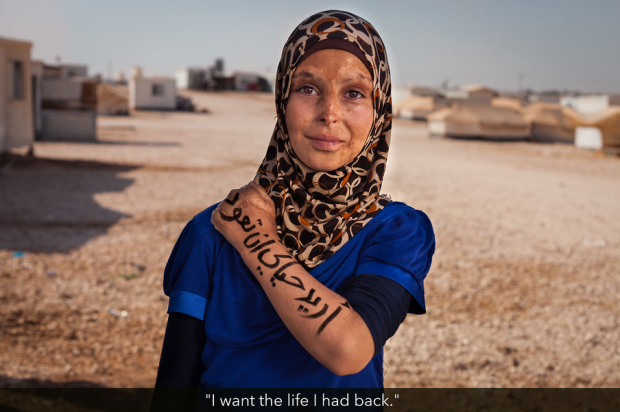 More than 2 million people have fled the war-torn country since March 2011, seeking refuge in neighboring nations. Despite already housing 2 million Palestinians, Jordan has taken in more than 500,000 registered Syrian refugees. American photographers Robert Fogarty and Benjamin Reece traveled to Jordan in September with the relief organization CARE International. For years, Fogerty has been working on “Dear World,” a project in which he photographs people with messages written on their arms. A year after almost losing her life in a gruesome racing accident, former Formula One test driver Maria de Villota passed away, being found in a hotel room in Seville on Friday. An autopsy showed that lingering injuries and neurological damage from her wreck a year ago were likely the cause of her death. Photos of touching tributes, words of remembrance and sadness were shared across Twitter after word of her death was announced. De Villota lost an eye in the accident which occurred last year, but had since seemingly recovered- even driving again, writing a book about it, and recently getting married. Mexico’s hopes of qualifying for the World Cup are still alive, thanks to their disliked rivals, the United States. While Mexico had a hard time in a 2-1 loss to Costa Rica on Tuesday, they were bailed out by the Americans, who scored twice in stoppage time against Panama. When stoppage time began, Mexico was on the verge of being eliminated from World Cup contention. Two minutes later, they had a playoff date with New Zealand! Check out what is trending in USA Twitter Trends of the Week.